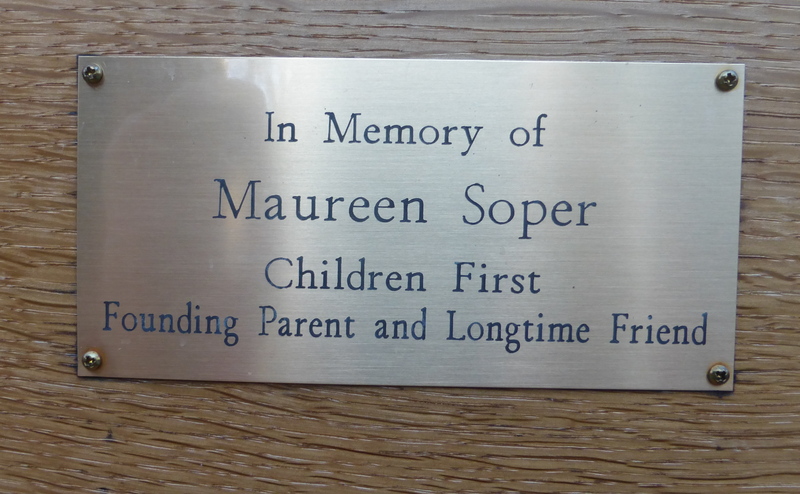 When founding Children First parent Maureen Soper died in April 2017, her family designated Children First as a recipient of donations in her honor. 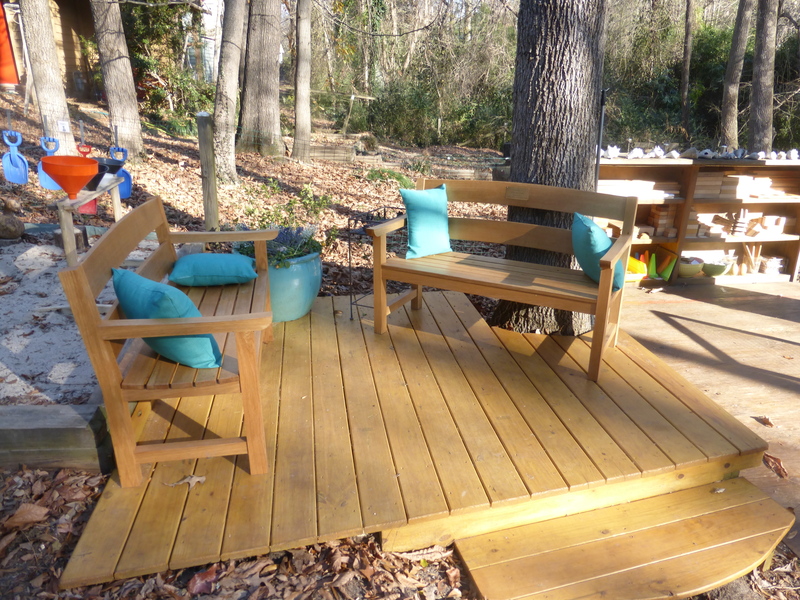 With those funds, we created a beautiful little seating space on our playground. 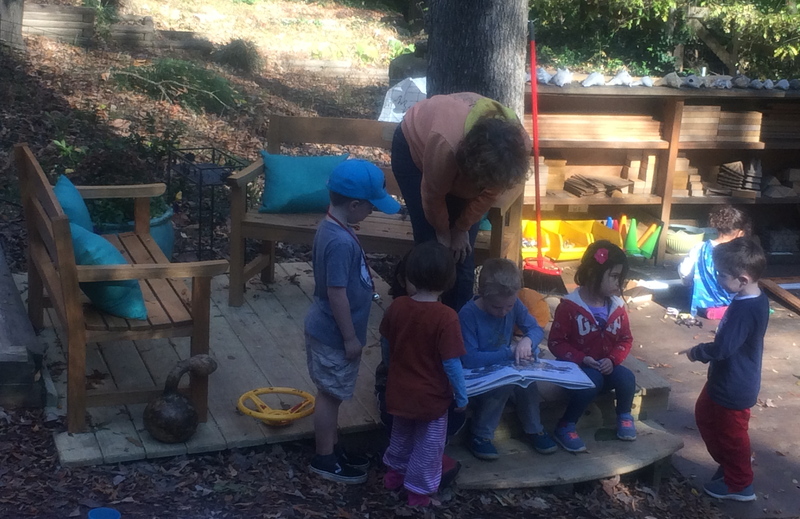 Many good things happen here: children play; children and teachers meet for conversation; and parents connect as they watch their children play after school. We especially hope this gathering place will nurture parents’ trust and affection for one another, and their sense of mutual responsibility and care for all the Children Firsters. This simple but powerful part of being in a parenting community – pausing to sit together and observe children in play – was something Maureen saw as a key component of what Children First calls “the caring conspiracy.” She believed, as we do, that it takes a village to raise a child, and that our village is more likely to thrive when it meets up, day after day, in a space that is comfortable, beautiful and close but not intruding on the children’s space for play. In October, after the deck and benches were built, we invited the kids and families who use it everyday to help us name the space. We began by brainstorming possibilities, and then went through two rounds of voting. The final vote was a landslide, and “Maureen Landing” had its perfect name – a place where we will “land” together in ways that honor our friend’s memory. 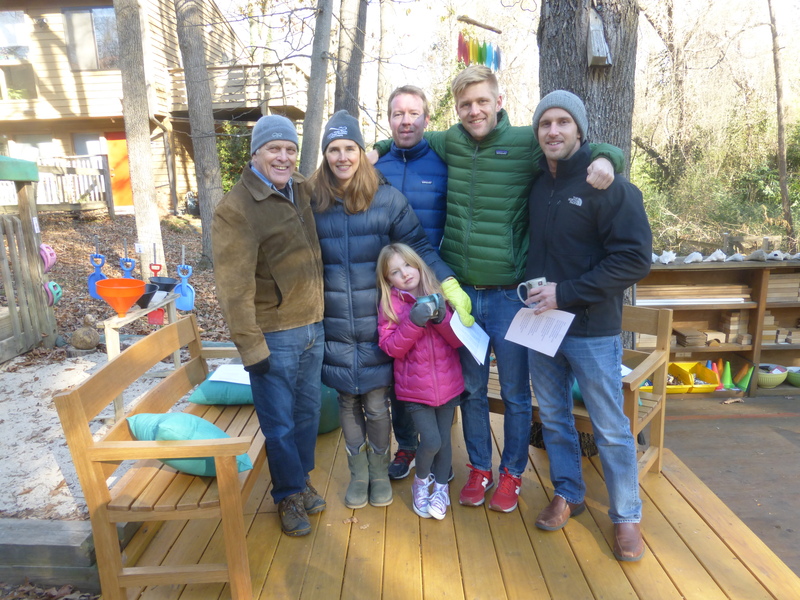 On December 28, Maureen’s family – her husband John; her children Emily, Will and Alex; her son-in-law Tim; and her beloved granddaughter Alice – gathered along with the King-McClain family to dedicate the space. 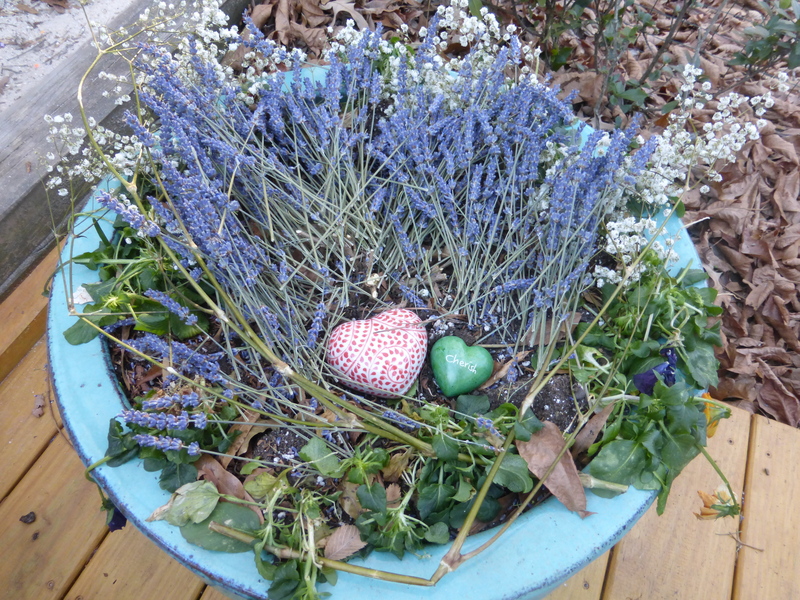 As part of the ceremony, John placed some of Maureen’s ashes in a little heart-shaped box in the flower pot on the Landing. What quality of Maureen’s do we hope will be remembered, lived and celebrated in this space? Donna: I hope that the children, families and teachers who talk and play in this space every day will experience Maureen as they are buoyed by warmth; as they speak respectfully and kindly to one another; as they find joy in deepening connection; and as they know an unshakable sense of belonging. John: I hope that they learn how to listen to others and take measure before commenting. Cara: I hope that kids and parents in the space feel the kind of unconditional positive regard I always felt from Maureen, and that they will also experience the kind of friendship that my Mom experienced with her. Anna: I hope they get to appreciate being outside and the beauty of nature all around them. Kevin: I hope they find their quiet strength. Emily: I hope they feel a sense of determination, and find something that they like and are interested in and keep at it, and not slow down. John: And that they are NOT ever bored. Will: I hope that they use this space to enjoy each other; to find people that they would like to know more about, find out about them, and enjoy that thing. Tim: I hope they approach this space with enthusiasm. 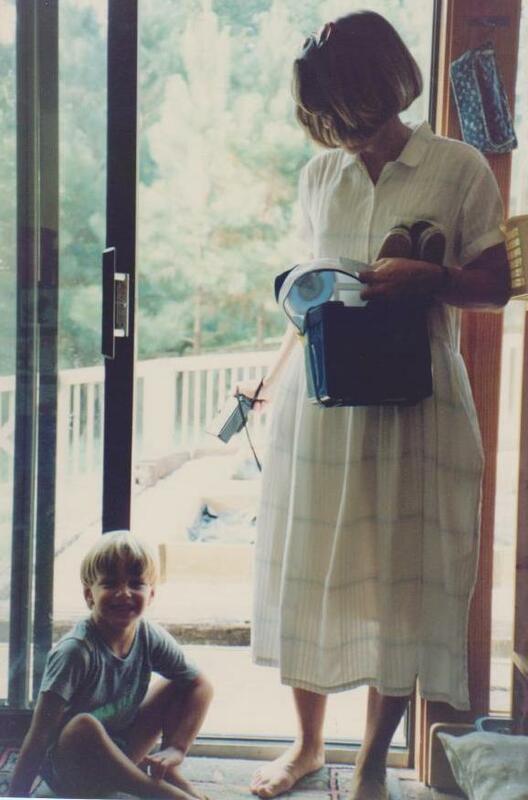 Josh: As the youngest, I don’t have particular specific memories of Maureen, but more a sense of what she was like in my childhood… and my overall experience of her – and that experience is one of kindness. I hope others find that here as well. Alex: I hope they have a space where they can be with people and feel connected, and not have to worry about the bad things in life. May this Landing be a place where we cherish memories of Maureen, and cherish one another. To help our many generous donors understand Maureen’s relationship with Children First more completely, I sent them a thank you that included an excerpt from my remarks at Maureen’s memorial. More here… Donna remembers Maureen Soper. Maureen and Alex arriving at school on the very first day of Children First, August 1990.